In September 2016, we arranged an open online dialogue to collect our stakeholders' views of how we should develop the sustainability of our operations. In all, the dialogue involved almost 600 people from 17 geographic areas, representing over ten groups of stakeholders. Of them, as many as 450 respondents were particularly active in the dialogue. "We are very thankful to all participants! The international dialogue, first one of its kind, gave very valuable insights on the issues that our stakeholders perceive as being crucial to our company", says Simo Honkanen, Senior Vice President, Sustainability and Public Affairs. During the dialogue, our external and internal stakeholders used an online tool to assess sustainability topics they and others proposed, as well as those considered the most important in 2014-2015. After this, our management and experts continued to process the 24 sustainability topics that the stakeholders considered the most important by evaluating their importance from the point of view of our business. This work resulted in the matrix of areas of sustainability that are material to Neste. How has Neste's materiality matrix changed? Developing the portfolio of advanced biofuels and their renewable raw materials and ensuring the sustainability of raw materials are still considered crucial by our stakeholders. External stakeholders continue to emphasize the significance of environmentally sound and compliant performance; the theme is considered even more important to our operations than before. Creating a strategic vision of responsible energy solutions in the future and the traceability and transparency of the raw material supply chain also emerged more visibly than before. Our external stakeholders included "Ethics, integrity and reliability", "Talent attraction and retention", and "Measuring and reducing water footprint" among the most important sustainability topics for the first time. Our net impacts on the environment and society were also included in the matrix as a new topic. Moreover, "Open and honest communications and stakeholder engagement" was included in the materiality matrix as a new topic. Neste is already familiar with this subject area, as it is closely associated with the previous years' "NGO cooperation" and "Taking part in local communities". The importance of the subject area to our business has increased from previous years. Our external stakeholders also consider increasing material and energy efficiency to be more important than before. Preventing deforestation and biodiversity loss in the supply chain, as well as good corporate citizenship and tax contribution are still considered important by our external stakeholders, but less essential than in previous years. Also, financial responsibility to owners is considered less important than before. Increasing the number of smallholders in our procurement of palm oil by supporting the development of farmers' sustainability expertise and certification of production, which we consider important, was overshadowed by more extensive sustainability themes in this year's assessment. The sustainability topics considered important by our external stakeholders and our own personnel were relatively consistent. Economic viability is still considered to be the most important topic by the internal stakeholders. They also emphasize the company's role in guiding society from using fossil fuels to renewable, low-carbon fuels. Similarly to external stakeholders, internal stakeholders consider the sustainability of renewable raw materials and development of the raw material portfolio to be key topics. Neste's management and experts consider human rights in the supply chain and developing well-being at work important, but less important from the perspective of our business than the previous year. Underlying this is probably the fact that we have invested in the development of these areas in recent years, and instead of being perceived as specific subjects of development, they are probably seen as essential parts of our day-to-day activities, and a similar emphasis was not placed on them in this year's assessment as in previous years. 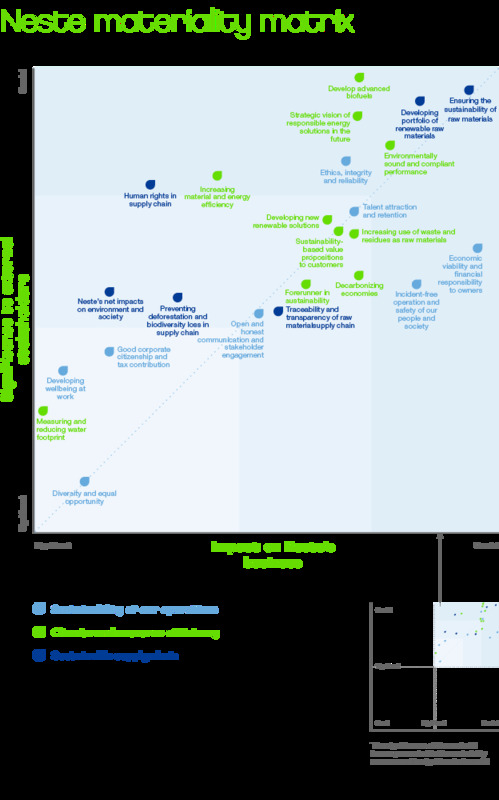 In other respects, the estimates of Neste's management and experts regarding the significance of sustainability themes to the business were largely consistent with previous years. We will utilize the results of the material assessment in updating the company's sustainability work plan and developing sustainability practices. We will also emphasize the essential sustainability topics in our communication and reporting. "Even though we are engaged in continuous close contact with our different stakeholders in different parts of the organization, this kind of international, systematic review and dialogue on sustainability themes with our stakeholders helps us to focus our sustainability work," says Simo Honkanen, SVP, Sustainability and Public Affairs.